When the Penn Vet Cancer Center (PVCC) launched a year ago, it hit the ground running. Today, the Center’s continued expansion is one of Penn Vet’s highest priorities and a focus of its Power of Penn Vet Campaign. Founded with the mission of bringing together the School’s already-strong cancer research and clinical care, the PVCC seeks to move cutting-edge science from the lab to the clinic. It also aims to draw on cancer research happening across campus to make breakthroughs that apply to animals and humans alike. At the core of the PVCC is a growing faculty of clinician-scientists. Recent faculty hires include medical and surgical oncologists with research interests that range from developing novel therapies for canine hemangiosarcoma and lymphoma to understanding how tumors battle with the immune system. Their work has added to the pathbreaking research already being done by Penn Vet faculty such as Nicola Mason, Gr’04, whose innovative use of a vaccine to treat osteosarcoma in dogs holds promise for addressing the same disease in children, and Susan Volk, C’91, V’95, Gr’98, a small-animal surgeon whose research on proteins that surround tumors may lead to new treatments for breast cancer in dogs and people. 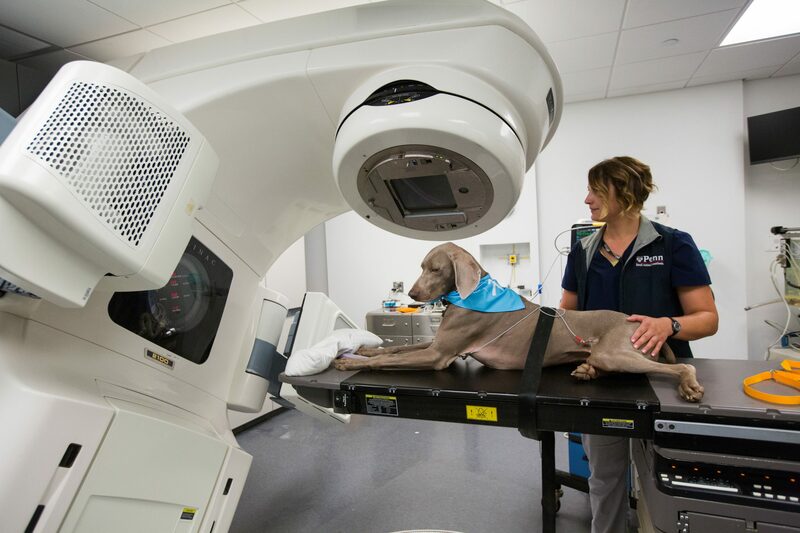 Penn Vet’s longstanding partnerships with Penn Medicine and the Abramson Cancer Center will play a key role in the PVCC—and give it the distinction of being the only veterinary cancer center in the U.S. so closely connected with a cancer center focused on human health. Especially promising are collaborations that build on Penn Vet’s expertise in investigating the tumor microenvironment—the structures and conditions around the cancer that can influence its behavior. PVCC’s integrated approach is also shaping the School’s educational programming. A new class on cancer biology and oncology, taught in part by clinicians, is giving students a window into how science shapes treatment. Broader Penn Vet curriculum changes expand student engagement in research and clinical practice. Also just off the ground: a new fellowship program for scientists interested in translational research in veterinary medicine. To learn more about how you can support the Penn Vet Cancer Center, visit their website. Gifts to the Companion Animal Research Fund, Fellowships, and Endowed Professorships at Penn Vet can be designated for cancer research.